De-clutter your dating experience. Our patent-pending Mismatch automatically filters sub-par messages to a Mismatch folder. That means no more digging through messages with vulgarity, text-speak, poor grammar/spelling, and copy-and-pasted content. Now you can kick back, relax and focus on just the right people. Everyone draws the line somewhere. Like in front of that dude who still thinks the world is flat. 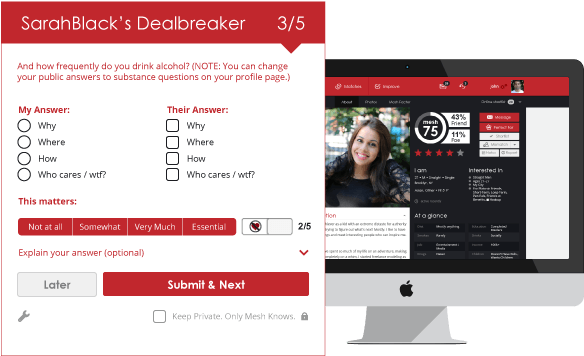 Before Mr. Smartypants can message you, he’ll need to see eye-to-eye on the important issues that you’ve set as your Dealbreakers. If he gets it wrong? Mismatch. If he gets it right? Maybe there's redemption after all. Not right for you, but perfect for your friend? 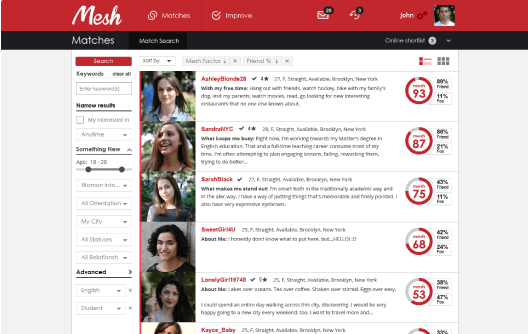 Play matchmaker with Mesh's Perfect For to set up your friends with their better halves. Send them the profile you think they'll like and make some sparks fly. Whether you prefer a certain religion or ethnicity, looking to get lucky in love or just to get lucky, only Mesh has to know. And unlike the other guys, we won't connect, link or publish to your Facebook. Mesh embraces all genders and sexual orientations without discrimination. We understand that people don’t come in boxes, and we won’t try to make you fit in one. We appreciate you for who you are, and welcome you just the way you are. Because if you wanted commercials, you'd watch basic cable. Easy on the eyes, since experiencing better starts at the first click. From 404s to dating don'ts, you've got our undivided attention. interested in GENDER Men Women All . would like and I would like and I would like I would like with .